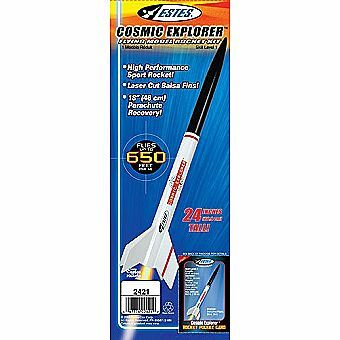 Search the cosmos with the Estes Cosmic Explorer! This unique sport rocket has styling and power that's BIG on performance. The Cosmic Explorer is an easy to assemble, high tech marvel on the launch pad. Powered with standard Estes engines, this adventurer can easily top the 1,000 foot level, then returns safely on a large 18 inch preassembled parachute. This easy to build, Skill Level 1 rocket is over 2 feet tall! It features quality body tubes, a super big balsa nose cone, laser cut wood fins and easy to apply waterslide decals. This action-packed rocket is great for beginners who are looking for awesome, high altitude performance in a remarkably streamlined rocket!